oYBikes, near West Kensington Tube station, originally uploaded by mike1727. Spotted these just round the corner from West Kensington tube station as I was en route to a meeting. Oybikes are rental bikes, available at selected locations around the city, though unfortunately concentrated in certain districts. 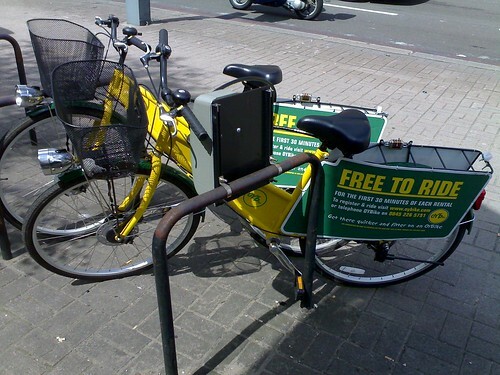 The bikes are locked to special stands until activated by a PIN sent to registered users via SMS. The bikes I saw were well suited to city use with light, basket, mudguards and shaft drive (to avoid those chain oil on suit leg moments), and these ones at least seemed to be in good working order. Given the nightmareish tube journey I had yesterday (20 minutes became an hour due to problems on the line I wanted to take), I'd have been better off travelling from Kings Cross to West Ken by bike. There's an OYbike rank on Euston road, just down from King's Cross station where I'd usually arrive by train; not on the station as I'd expect, but down the road outside a hotel. Commute riding in an unfamiliar city can be a bit of a challenge. As an out of towner who usually travels by tube, my mental map of central London doesn't really focus on above ground journeys longer than a mile or two, so navigating and dealing with heavy city centre traffic can be stressful. As a result I often take the easier option and look for bike route and backstreet options which are more roundabout but often much more interesting. I'm sure this is the case for many of oybike's customers, and it's in oybikes interest to extent usage beyond the 30 minute free period. So, you'd expect a bike2.0 outfit like oybike to at least present a 'quiet streets' option on their website routefinder then? Nope. The google-powered mashup the oybike site uses routes you down the major streets between the two destinations, not the quieter backstreets, and there's no easy way to change the route criteria to suit a bike. The Transport for London site gives a better route. You have not been around in quite a while. Everything ok?